We admire a great script. In our view, a great script is one that hides itself from us. It creates characters we love or hate, and makes us believe on-screen events are unfolding organically. Such is the case with the 1957 western, Gunfight at the O.K. Corral, the famous story of upright lawman Wyatt Earp and his unlikely partnership with the morally ambiguous Doc Holliday. The script has all the hallmarks of a great western: memorable lines, interesting characters, and authentic-looking sets. But Gunfight at the O.K. Corral offers something more. It is an unflinching look at how people (us) choose to live their remaining days. 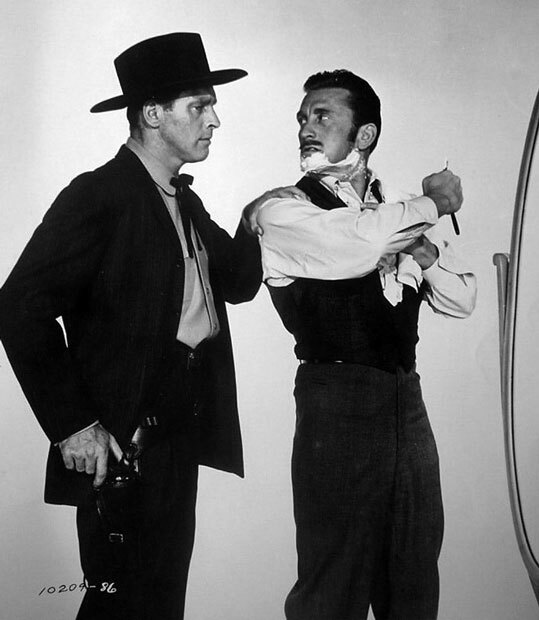 Burt Lancaster is Wyatt Earp, a man who wears his Sense Of Justice as comfortably as his freshly-pressed shirts. Kirk Douglas is Doc Holliday, a former dentist who is “in a state of complete financial collapse” and frequents poker games to support himself. But, given all this, the film doesn’t feel heavy and morbid. That’s because the crackling screenplay gives us hope, as embodied in Wyatt Earp and Holliday’s mistress. Ah, but one day he does meet a woman (Rhonda Fleming) and suddenly there are new possibilities in life. He needs to ask if enforcing the law in Tombstone is really what a man wants; if Tombstone will be the end of the line for him. But it is Douglas’ on-screen mistress (Jo Van Fleet) who shows us life is worth living. Even though she and Douglas have twisted relationship – as the screenplay makes evident early in the film – she refuses to give up on him. Douglas spews existential rubbish (“We don’t matter, Kate. We haven’t mattered since the day we were born.”), and still she nurses and mothers and loves him. She sees value in him that years of drinking and disappointment have concealed from his view. This film was written by American novelist Leon Uris, who also wrote the screenplay for Battle Cry as well as lengthy, well-researched tomes like Exodus. Gunfight at the O.K. Corral was the eighth top-grossing film in 1957, thanks in no small part to its shrewd casting, expert direction, and brilliant, thought-provoking script. But it did not win the Oscar in the category for Best Writing, Story and Screenplay. The Oscar for best original screenplay that year was awarded to Designing Woman, a delightful romantic comedy. But certainly no Gunfight at the O.K. Corral. Gunfight at the O.K. Corral: starring Burt Lancaster, Kirk Douglas, Rhonda Fleming. Directed by John Sturges. Written by Leon Uris. Paramount Pictures Corp., 1957, Colour, 122 mins. Another review of Shootout/O.K. Corral movies can be found at Ted Hicks’ fab movie blog. Next Announcing the Great Villain Blogathon! Great discussion of Douglas and Lancaster on your YouTube Channel. They really are magic together on screen, aren’t they? Absolutely. Another thing I love about this western are the names from Earl Holliman to Lee Van Cleef and John Ireland filling out the cast. Another winner, Ruth. I’m no western fan, and I’ve only ever seen bits and pieces of this one, but your write-up makes me want to give the whole thing a try. If you’re able to see the whole thing, it is worth it. The chemistry between Lancaster and Douglas is terrific, but the top-notch supporting cast is wonderful, too. Really, I could go on about this film all day. Yes to everything. I just love this movie, have seen it a lot and have another reason to check it again! The combo of Burt & Kirk is excellent and I agree with all you said about how good the script is, especially as you said, like good acting it shouldn’t be obvious, just naturally put all the plot parts and the right words where they should be. I’m always struck by Leon Uris’ script or Douglas’ flamboyant character or Lancaster’s restraint. The film always feels fresh. Ruth, BRAVA to you for your moving review of GUNFIGHT IN THE O.K. CORRAL! I confess that I usually gravitate toward playful Westerns such as SUPPORT YOUR LOCAL SHERIFF, but your post touched my heart and made me think. You’ve kicked off this year’s 31 DAYS OF OSCAR in a wonderfully moving way; kudos, my friend! Thanks, Dor! I hope you’re able to give this one a go. I think your witty side would appreciate Kirk Douglas’ character, and your thoughtful side would appreciate the underlying themes. I really think you’d like this one. You know I have a love for great (or even just pretty good) Webster’s and this one is almost too much fun for words. Luckily you have found the words, and the perfect ones at that. This screenplay is one that never gets tired or old. It’s funny, hear-warming, and actually very poignant. Thanks for such a stand out post. I enjoyed reading it, thoroughly. This film really is poignant, isn’t it? And funny and thought-provoking, like you said. I first saw this several years ago, when I thought all Westerns were one-dimensional and predictable. “Gunfight at the O.K. Corral” practically blew my mind. Thanks for your kind words. In my world, you are the Western Go-To Guy. Great western well worthy of awards. Also love Frankie Laine and that great title song. Douglas and Van Fleet should have at least have been Oscar nominated. I completely agree re: Douglas and Van Fleet not being nominated. What on earth was going on with the Academy that year?! Whenever “Gunfight at the OK Corral” shows up on TV I tell myself that I will switch over just for the theme song. That’s all. Every time I am drawn into the story and the satisfying experience of the movie. With very few exceptions, the Academy seems to have blinders on where westerns are concerned. They see cowboy hats and they fail to see the artistry in a script or performance. It is maddening. Is it possible to ask the Academy for a do-over? I’m serious. I think it’s wonderful that you focused on a script. And the way you express your appreciation (“In this film, death is a character sitting at a corner table, calmly sipping a whiskey and studying those around him.”) reveals that you have a way with words yourself. BTW, do you know who is hosting this week? I’m eager to read other posts but I can’t find the hub! Thanks. Ah, you are right, and you’ve actually calmed me down. I was getting rather riled and thinking of writing letters and starting a social media campaign…but this film really does have the last laugh. One of my favorite westerns. I’m always partial to the scene in the barber shop where Douglas flawlessly delivers his dialogue while drying himself and putting the cologne on. He doesn’t miss a beat for the whole scene. Love the song too, one of my favorite Tiomkin scores. I know it has nothing to do with the facts, but that’s what documentaries and history books are for. Douglas is AMAZING in that scene. He truly is flawless. I don’t think there are very many actors who could do that… John Wayne was another one who could multi-task in a scene like that, and make it look easy. Thanks so much for participating in our 31 Days of Oscar blogathon! For me, I agree with you- what really makes this film a masterpiece is that perfect chemistry between Douglas and Lancaster- but great supporting character actors here too! Such compelling performances. Wonderful write-up!! Douglas and Lancaster were brilliantly cast. Lancaster is cool & collected and wisely lets Douglas do all the theatrics. It’s such a treat to watch them in their scenes together, isn’t it? Wonderful review! I like when Douglas steals some scenes with funny lines or too much drinking. Westerns were severely overlooked in the past. Today, with “bigger names” doing westerns, it is not so overlooked. But it is a shame this film wasn’t nominated. You’re right, Le, when you say Westerns are more appreciated these days. It’s a shame so many of them – like this film – were overlooked in years past. Only realized as I read your thoughtful write-up that I’ve never seen this! I must remedy that right away. I’m rarely drawn to Westerns, but always like what I see in the end. Based on your description of the depth depicted, it no doubt deserved a nomination. Oh Aurora, you must see this one! Don’t let the “Western” label dissuade you. It is a real treat to watch. Will do! I think I may even have in on DVD. SO LITTLE TIME! Thanks for tipping off that Uris wrote this famous Western and Exodus one of my favorite Newman movies…my to see again list of movies is growing the first weem of this Oscar Blogathon! I was stunned to see Leon Uris’ name in the credits the first time I saw it. But the screenplay is so clever and thoughtful that only he could have written it. This is a terrific blogathon, no? I love reading everyone’s “rants” about Oscar snubs. Like Aurora, I haven’t seen this. i don’t know how I missed it. I couldn’t get through EXODUS, but this sounds fabulous. This is fabulous. Douglas is too much fun, and the supporting cast is top-notch. It’s one of my faves. Agreed that this is one of the great 50s westerns, Ruth! Lancaster does that unbending, stern lawman thing so very well, and the whole cast is terrific, but, to me, this is Douglas’ movie in the end and he makes the most of it. Some of my friends criticize the continuous Frankie Laine sort of “sung narration” that peppers this film, but I like it, corny or no. I hadn’t really thought of the Jo Van Fleet character that way before – thanks for giving me some added appreciation there…will pay more attention to her the next time I watch this -hopefully on the spanking new Blu-Ray edition! You mean to say this is now on BLU-RAY?!! GET OUT!! A terrific review of a western that is rewatchable many times over. Lancaster and Douglas, as others have mentioned, are bigger than life, and they play well with each other. It’s all phony as hell but also entertaining as hell also. Whenever I watch this I always wondered how do they stay so clean considering this was the wild west? (LOL) But I do love this film, the score is great, the film is fun, supporting cast is outstanding. I know what you mean about being so clean! For pete sake – Lancaster rides a horse through dusty Arizona for 20 miles and there’s no dust on him, nor even a trace of sweat. He always looks like he just came from Wardrobe. Ruth, I really enjoyed reading your review of this movie. My husband and I have seen more recent versions and enjoyed them, so I think after reading your opinion on the quality of the 1957 movie, we should definitely see it. I love your description of death as being a character in the movie, and your term “existential rubbish” for Douglas’s words! And, it is nice to know with all the talk of death in the movie, there is still an element of hope in it as well. Thanks for calling this movie to our attention. I can’t believe I’ve never seen this – but considering that Westerns are probably my least-watched genre it’s not surprising! I recently watch High Noon (which I enjoyed), so perhaps I’ll continue the trend and give this a go! *gasp! * You haven’t seen this? It’s a great flick, and Douglas + Lancaster are terrific together.